How many stories have started out with 'a man walks into a bar'? The man who walked into John B's on Thursday night last is an alcoholic. There's this terrible feeling when someone you know breaks out. Maybe the words should read 'broke in' and the break in is to the prison that is alcoholism. The man who walked into the bar was Kenneth Egan, and he asked for a pint, but it was a pint of water with blackcurrant. 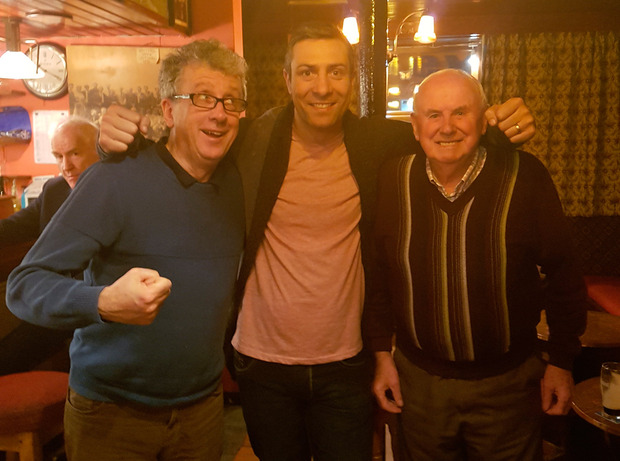 Egan with Billy Keane and Billy Looney (right) in Listowel. It got me thinking. Here I am selling alcohol every night and our Olympic silver medal hero from 10 years ago was on his way back from a seminar on drugs and drink here in my home town. His struggles with alcohol have been well documented. Unlike many sports people who have addiction problems, Kenneth went public. "Do you find it tough being in a pub?" I ask him. "I only stay in the pub for a few hours at the most when I am invited to a party and then I head away home." His phone rings. Kenneth tells the caller: "The talk went very well and there was a big crowd there." The next day he tells me the caller is his wife. Karen gets nervous before the talks he gives on addiction. I send him in to the kitchen for the private chat with Karen. He comes back out and takes a photo with my cousin Billy Looney, who has just turned 80. Kenneth puts his fist to Billy's chin, jokingly. Egan doesn't sit. He moves from side to side like a boxer. He's lovely to everyone, but he eventually has to bob and weave away. We meet for tea in The Listowel Arms the next morning. Kenneth has come a long way from the womaniser and the boozer who was almost counted out. Kenneth took a diploma in psychology and then he went on to complete his degree in addiction studies. "The word 'degree' used to frighten me because I didn't class myself as articulate," he tells me. He wrote his thesis on five retired Olympians and how they coped with the changes brought on by retirement. Retirement didn't suit Egan. "I turned in to an absolute bo***x. I was in a very dark place. People started to call me Kenny, but I was never Kenny at home or with my friends. I was just Kenneth. Kenny became an alter ego. Kenny drank. Kenny was a womaniser. Kenny treated his partner badly and left her." There was a night in his local when he overheard someone say "there goes Paul McGrath". At the time Paul was gone off the deep end. "It struck a chord. I could see myself in 10 years' time in the pub. I'd be saying 'see that fella over there', and I'd point at my photograph on the wall of the pub with the silver medal around my neck, 'that's me, any chance you could buy me a pint'." His family backed him and before long Kenny was sent packing. The man who was counselled is now a counsellor who speaks to groups all over the country. Kenneth also does one-on-one sessions. It's easy when talking with Egan to see why he was elected to Dublin County Council. His mental health tips are "to stay in the here and now and to start off in the morning by saying to yourself I will have a better day today". I go back to the phone call he took in the pub from Karen. "She calls me after every talk I give. I treated her very badly, but she took me back. I was sober at the time and was attending AA meetings. We had Kate two years ago and Karen says I look at Kate like I look at no other person and I'm totally happy." Karen has a daughter from a previous relationship. Kelis is 16 and Kenneth tells of the guilt he felt when he walked out on Karen and Kelis when she was just six years old. Does he miss big-time boxing? I mention Eamon Dunphy's famous line about George Best: "George was constantly in search of the buzz." Kenneth was also on the trail of the buzz and he quotes French philosopher Blaise Pascal: "All of humanity's problems stem from man's inability to sit quietly in a room alone." I tell him my theory about the shyness of the great sportsmen and their using drink to become the person the public think they are; their very own Kenny. "I'm shy. It took a huge effort to get me to stand up in front of a room full of people and talk about my problems. I drank to get courage, but now I've the confidence to open up." I wonder if Kenneth is too nice for politics, but he wants to make a difference. Low blows are punished in the ring and politics is a blood sport. Kenneth is a husband, father, family man, graduate, politician, counsellor and campaigner. And, yes, an Olympic silver medal winner. There were times when he wondered was the medal worth the attention. 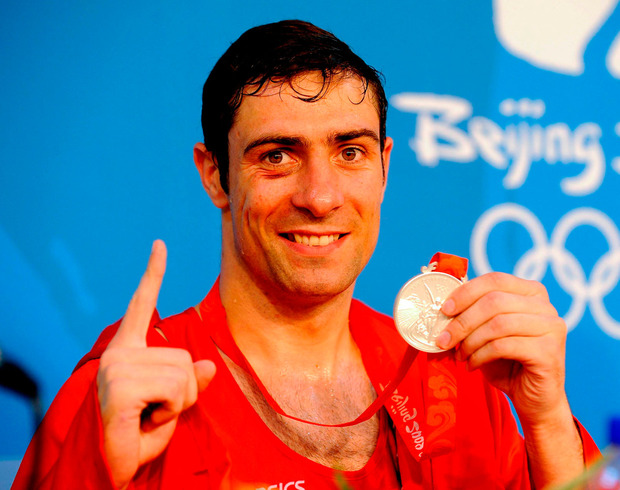 Kenneth Egan has found redemption through a type of constant confession. His mission is one of prevention and cure. His message is a story of hope, for those who feel they are beyond hope. And yes, Kenneth, you are articulate and you are bright. Goodbye Kenny. Kenneth is doing just fine.